I have been meaning to make something like this for a while, but have not been organised enough to pre-soak the beans and defrost the pork bones. 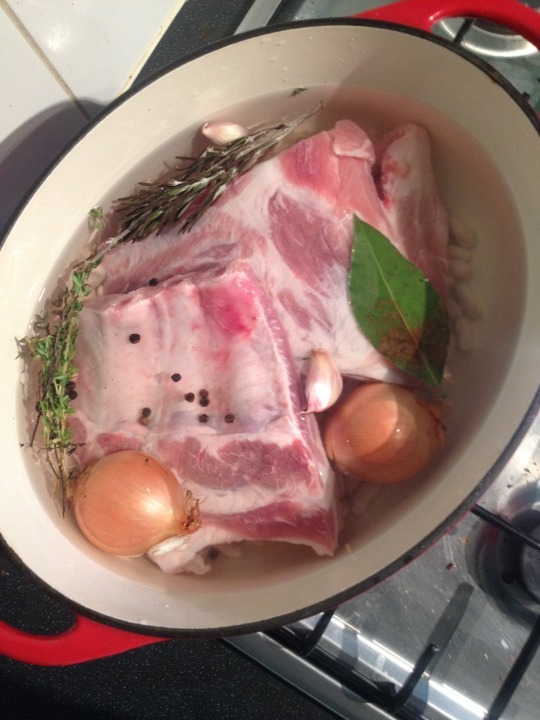 Finally yesterday, a mid-morning text from my friend Daisy gave me an excuse to get on with it and I placed dried cannellini beans into a big bowl of water and took the rib bones left from butchering a pork belly out of the freezer. If you don’t have bones, then a piece of belly will be fine – save it to eat cold or slice and add to this dish. 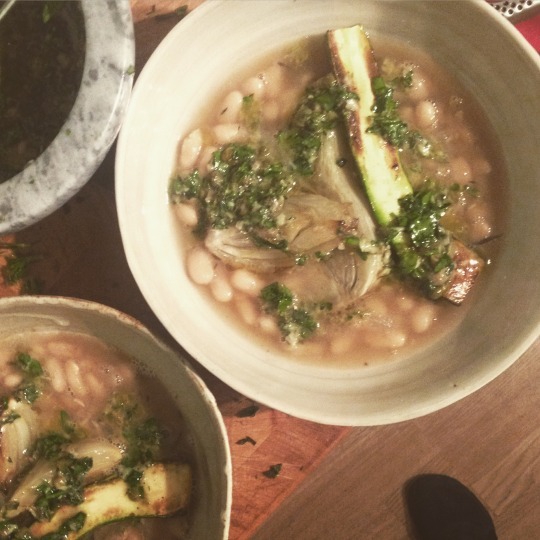 The bean broth had a delicately piggy savoury flavour and the soft fennel and lightly charred courgette made it feel like spring with the bright, garlicky piquancy of the salsa verde. I was very pleased with this and think that maybe it’s the best thing I have cooked this year. Asparagus would be a good addition if you have some. Soak the beans for 6-8 hours or overnight in a lot of cold water. Place them in a large pan with the rib rack cut into two with scissors, and all of the other ingredients. Add enough water to just cover everything. Bring to the boil fast for 10 minutes and then with a lid half covering it, simmer gently for 1 hour 30 minutes until soft. Remove the pork bones. Season well with salt and a bit of black pepper. 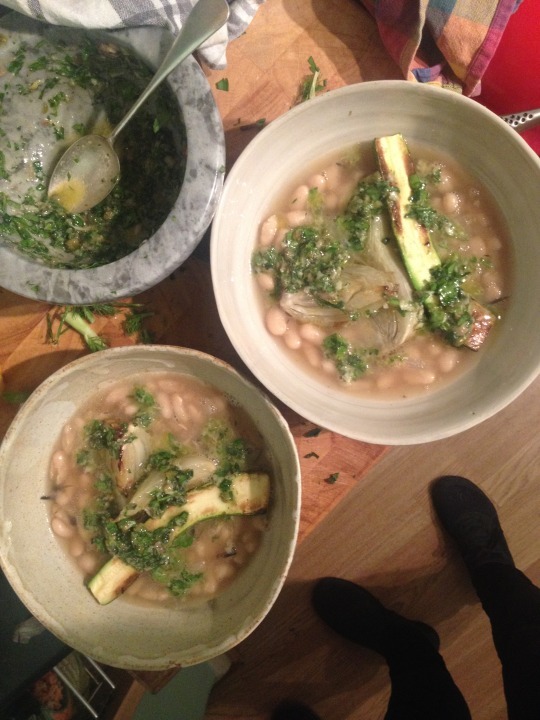 Discard damaged outer layers of the fennel and trim the bottom and the top of any browned bits. Cut it into six segments, lengthways. Heat 2 tablespoons of oil in a frying pan and when hot, add the fennel and fry until browning, turning occasionally. Then place in a small ovenproof dish with the oil and ½ cup of water and a pinch of salt and cover with foil Bake for 30-40 minutes until soft. Cut 1-2 small courgettes in two, lengthways. Season with a sprinkle of salt. In the same pan as you fried the fennel, heat to high, place in courgette cut side down and cook until brown and scorched, then remove from the pan. Pound the anchovies and garlic in a pestle and mortar with a pinch of salt until they’re a paste. Mix in the capers. Drizzle in olive oil while mixing. Mix in herbs. Squeeze in lemon juice to taste and season to taste with salt and black pepper. Ladle the beans into two warmed bowls, avoiding the peppercorns and the woody herbs. Place the fennel and courgette on top. Drizzle with salsa verde.